We all know how easy it is to pop into the supermarket with the intention of picking up a pint of milk, but come out with a bulging bag of unplanned purchases. There is a psychology around supermarket layout, designed to entice us in and spend money. Where products are positioned in shops has an impact on how likely we are to buy them. Research shows that the visibility of products in a retail environment has a nudging effect on shoppers and ultimately influences which products we choose to buy. So when those products are mostly unhealthy ones, then it’s bad news for our waistlines as well as our wallets. The Obesity Health Alliance has published a new report – ‘Out of Place’- which surveys the type of food and drink products promoted prominently in locations such as shop entrances, aisle ends and at checkouts in five supermarkets. Asda – 73% of food and drink products promoted at checkouts were sugary foods including sweets and chocolate bars. Morrisons – 47% of food and drink products promoted at checkouts were sugary foods including sweets and chocolate bars. Aldi – 30% of food and drink products promoted at checkouts were sugary foods including flapjack and popcorn. The use of moveable free-standing display units (FSDUs) to promote sugary products was particularly common. 79% of products included in FSDUs were sugary foods. On the day of the survey there was considerable variation between supermarkets, e.g. Aldi had food placed in just one of the high profile locations surveyed and Tesco and Sainsburys did not have food promoted at checkout areas. The emphasis on sugary products at these prime locations is particularly concerning. Children aged four to ten are eating twice as much free sugar as the recommended daily intake and this is a key driver of rising levels of childhood obesity and tooth decay. 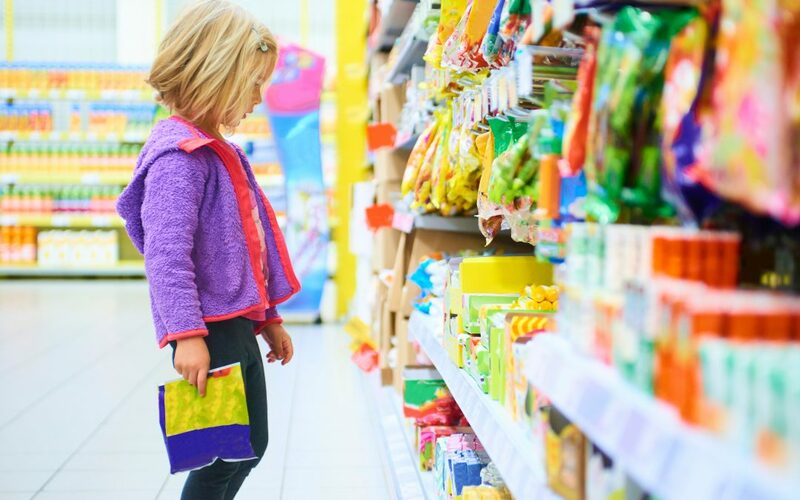 Whilst the majority of food and drinks located in high profile areas in the supermarkets surveyed were for processed products that significantly contribute to children’s sugar and calorie intake; less than 1% of the products located in high profile areas were fruit or vegetables. According to ‘The Eatwell Guide’, to achieve a healthy balanced diet we should eat five portions of fruit and vegetables daily – making up over a third of our diet. The promotional environment within supermarkets does not align with healthy eating guidelines. With more than one in three children having a weight classified as overweight or obese by the time they leave primary school aged 11, more needs to be done to encourage retailers to take a responsible approach to the promotion of unhealthy food and drinks. Restricting the promotion of unhealthy food and drinks in prominent locations will help families avoid impulse purchases of unhealthy foods, making healthier choices easier. This is why we are calling on the Government to restrict the placement of unhealthy food and drinks in high profile locations in supermarkets to help families make healthier choices when shopping. November 2018. OHA. Out of place: The extent of unhealthy foods in prime locations in supermarkets. Public Health England (2018). National Diet and Nutrition Survey: results from years 7 and 8 (combined).